The gateway town to North Pembrokeshire and the end of the Ceredigion Coast Path trail which is marked with the statue of a bronze Otter quietly gazing out from below the Castle over the River Teifi. Cardigan (Aberteifi) is the major town in the region and sits above the medieval bridge over the River Teifi, the first inland crossing point of this mighty estuary. At the end of the bridge are the dramatic walls of the castle which forms the heart of this compact town opposite the waterside Heritage Centre. Cardigan Castle was built by Rhys ap Gruffydd, ruler of Deheubarth, south Wales. To celebrate its completion in 1176, he held the first ever Eisteddfod - a celebration of Welsh literature and music – at the castle. Like so many castles in the region, Cardigan Castle changed hands many times over the centuries that followed before being partially demolished during the English civil war. Afterwards, ‘Cardigan’s forgotten castle’ was neglected for many years and very little of the original structure now remains apart from the outer walls. In 1808 Castle Green House was built within the grounds. From the 1940s the house and castle were owned by the reclusive Barbara Wood, who initially lived here with her mother, and after latter’s death, alone aside from her many cats, without gas, electricity or water. In the 1980s the house was declared unfit for habitation and Miss Wood moved into a caravan while the house fell into greater dereliction. Eventually, in 1999, she moved into a nursing home and four years later the property was purchased by the local authority. Now, after a major restoration project, both house and castle walls have been renovated and reopened as a visitor attraction, including exhibitions on the castle and Cardigan’s history, on the story of the Eisteddfod and on the story of Barbara Wood, the last private owner of the castle. 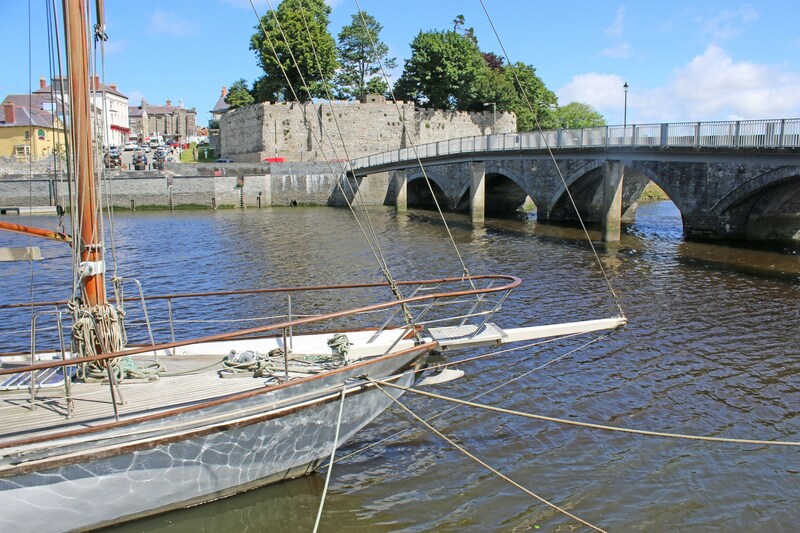 The town and port that grew up around the castle prospered in the 18th century, possessing seven times the number of ships that Cardiff owned, but later suffered declining fortunes with the silting up of the Teifi. Now, however, regeneration is giving the town a facelift, and with the castle as a cultural hub, the town is attracting attention for its arts scene and independent craft shops. While you are here, try and check out Theatr Mwldan arts centre, which promotes a diverse range of performing arts including cinema, music, drama and film, at its complex in the centre of Cardigan. There’s also Small World Theatre, a puppet theatre housed in an eco-building and an indoor market at the historic Guildhall from Monday to Saturday. The busy high street has the biggest range of shops, pubs, cafes and restaurants since Aberystwyth to explore and there are some unusual floating restaurant options in the river area. A short distance outside Cardigan is the Welsh Wildlife Centre Headquarters in the centre of the Teifi Marsh Reserve. Species you may see include otter, kingfisher, bittern, hen harrier, lapwing, curlew, brown hairstreak butterfly and hornet robber-fly see the Welsh Wildlife Centre. This is an inspiring place with loads of information, short walks with panoramic views of the beautiful Teifi Marshes Nature Reserve which is the centre piece here. The Licensed Glass House Cafe has "tree top" views right over the reserve from the third floor Glasshouse Cafe. Getting to the reserve from Cardigan is easy for walkers - its only 1 mile from the road bridge in Cardigan which is on the Wales Coast Path. The route is along a purpose made cycle path/walkway by the river part of the Cardi Bach Cycle Route. If you have a rest day in Cardigan you can easily combine the wildlife reserve with a walk onto St Dogmaels to visit the Abbey ruins and the pretty riverside village at the start of the Pembrokeshire Coast Path again only 2 miles on from Cardigan on an easy trail. You can walk out to both and bus back. If you’ve still got some energy left at the end of your walk you can also try a host of outdoor activities at Cardigan Bay Active – everything from coasteering, to climbing to kayaking and canoeing. So, if you fancy canoeing down the River Teifi for sunrise or a kayak trip to view the coastline you’ve just walked from the seaward side then why not book a trip – a great way to finish your walking holiday!